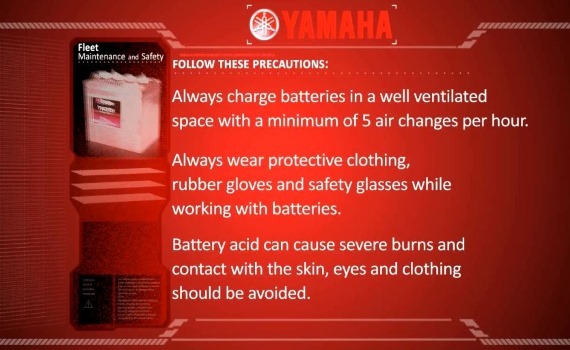 Taking care of your Yamaha Golf Cart’s batteries will make them last years longer. You can run into problems quickly without proper maintenance to the battery set in your Yamaha cart. Please follow these tips in the video for the best care. Water is essential to the life of a battery. Improper fluid levels can cause batteries to perform poorly or fail prematurely. To prolong the battery life and performance, check the electrolyte levels in your batteries on a weekly basis. Add distilled water to batteries as needed when checking battery water level. Please follow these precautions. Do not perform battery maintenance while smoking. Keep sparks flames and other sources of ignition away from your golf car and batteries. Lead acid batteries contain explosive gases that can easily ignite. Always charge batteries in a well-ventilated space with a minimum of 5 air changes per hour. Always wear protective clothing rubber gloves and safety glasses. While working with boundaries battery acid can cause severe burns and contact with the skin, eyes, and clothing should be avoided. If you get battery acid on your skin or in your eyes wash or flush immediately with water and seek immediate medical attention. To check the electrolyte levels in your batteries first raise and remove the seat to expose the batteries. Prior to removing the caps inspect and clean the tops of the batteries with a one to one solution of baking soda and water. If necessary to remove any corrosion that may be present. Use care to ensure that the cleaning solution does not enter the batteries. Rinse the solution from the batteries and dry the tops using a shop rag. Carefully remove the battery caps and inspect the electrolyte level. If the plate is exposed and the electrolyte level is below the top of the plates, add just enough to allow water to cover the plates. Replace the caps and charge the batteries. After charging is complete check the electrolyte level again to ensure proper levels. Never charge batteries if the plates are exposed. Prior to reinstalling the battery caps check to be sure the rubber grommets that seal each cell are present, fully seated, and not damaged. Remember, while not enough water can adversely affect overall battery life and performance it’s important to remember that overfilling can be just as harmful. For maximum battery life use only distilled water. Replace the battery caps and check to ensure that they are seated and all terminal connections are tight. 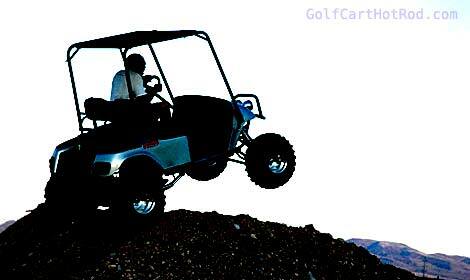 Find more golf cart battery help here.